What a fantastic premise for a travel book. In 2009, Ben Groundwater, the author of ‘The Backpacker’, a travel blog on the Sydney Morning Herald and Age websites, decided to do a lap of the globe, touching down on each of the inhabited continents. The idea: to glimpse the world through the eyes of someone who lives locally. Groundwater put out a call to his readers asking to crash on their lives for a night or two. He was inundated with offers. After careful selection, Groundwater settled on a mix of major cities and out-of-the-way places. And the adventure began. Groundwater’s success as a blogger is not surprising. He has a funny, open-minded, endearingly hapless perspective. In the care of his varied but universally generous hosts, he does a good amount of eating and even more drinking, in all kinds of unique situations. He attends a wedding (the Czech Republic), falls off a bike stoned (Amsterdam), oogles beautiful women (Warsaw), breaks open a coconut with a machete (Brazil), and, of course, learns there are five ways to carry a goat (Ethiopia). Groundwater tells a great yarn. If there is any flaw with 5 Ways to Carry a Goat, it’s that, because the call for invitations went out to overseas readers of an Australian travel blog, most of the invitations were from Australian expats. His trip goes deeper than tour bus observations, but often reveals more about the expat experience than about the cultures in which they live. Perhaps Groundwater’s next lap around the globe will take him to the places travelers rarely go. That’s another book, however; and, based on this one, I’ll be first in line to read it. 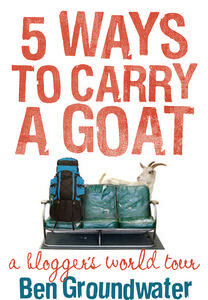 5 Ways to Carry a Goat, Ben Groundwater, University of Queensland Press.